At Transperth, we take a very serious approach to passenger safety and security. An integral part of that is our Transit Officers who work to increase the safety of all our passengers right across the network. Find out what it’s like to fill the shoes of Alan Fuller, one of our Transperth Transit Line Supervisors. For many classes, accessing Group Ticketing on board our network has been a matter of calling their Passenger Service Manager to handle bookings. For 2018, we have streamlined the process and these changes will affect all new group ticketing requests. The new Constable Care Safety School is now open and taking bookings for Term 4, 2017. The Constable Care Safety School is an excursion destination for children aged 4-11 and provides students with a hands-on opportunity to learn vital pedestrian, bike and public transport safety skills. On Friday July 14, Transperth Education held a VisAbility Experience Day which allowed a group of 12 teenagers, with varying degrees of visual impairment, to experience our network in a safe and controlled environment. Join the network of Your Move schools sharing tips on how to motivate students to get moving and create healthy habits for life. plus, have fun and earn rewards for it. Our new ‘Don’t Mess With Bus’ safety campaign aims to raise awareness and reduce number of near misses and accidents around our buses. Here, we take 5 with our very own bus driver, Bronwyn Edwards. Awesome student workshop makes music across the Swan River. Learning how to travel independently is a big step in every student's life. Here are some tips for teachers, parents and students on how to make that transition into high school as easy and safe as possible. If you’re interested in walking or riding to school or just want to have a fun and inspiring day – take part in the TravelSmart to Schools Workshop on 4 November from 9am to 2pm. In Term 2 the Transperth Education Team; David, Carol-Ann and Louise, were lucky enough to visit Tapping Primary School to deliver a very special launch of our Get on Board website. 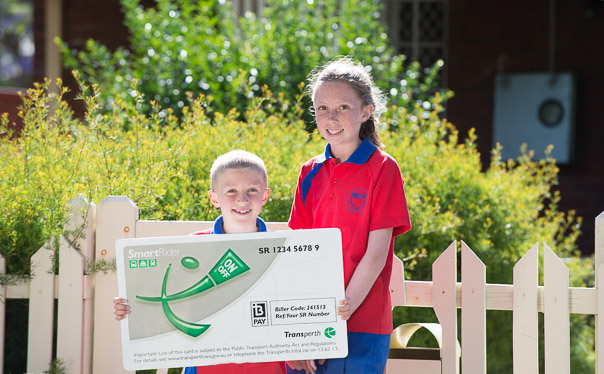 Transperth can’t help parents get their kids out of bed, or get them to pay attention in class, but we can make it easier to plan their trip to and from school thanks to the new Get on Board website. Created specifically for Teachers, Students and Parents in mind, increasing your classes knowledge and confidence in catching public transport has never been so easy and accessible. Read here to find out how Get On Board will help your students today! The arrival of The Giants set new patronage records as massive crowds converged on the city to see The Diver and Little Girl giants grace the streets of Perth. It was the biggest public transport event in our history with families and groups making their way in from all over the state. If you are thinking of taking your class on an excursion read this article to find out how we can make your travel a GIANT success.